(Newser) – People who like a little heat in their meals just might be doing their longevity a favor. So report researchers this week in the British Medical Journal after studying the health, diets, and alcohol consumption of more than 485,000 people in China. Controlling for many variables, including family medical history, age, education, diabetes, and smoking, they found that those who ate spicy foods—mainly via chili peppers—once or twice a week enjoyed a 10% reduced overall risk for death than those who ate spicy foods less than once a week, reports the New York Times. 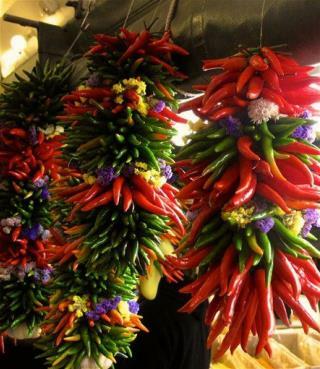 And that reduction improved to 14% when people ate spicy foods six or seven times a week. My love of Barbecue Hot Sauce has been vindicated. Won't help getting your wife to...not spit. That extra time you get from eating chill peppers is spent on the toilet.